When you have a creative job, you need an equally creative resume to showcase your skills. Whether you are a web designer, graphic designer, or you just need to get ahead of stacks of resumes that all look the same, a visual resume can help put the focus on your skills and experience. Canva has thousands of creative and visual resume layouts that you can easily edit with intuitive drag and drop design tools. Whether it’s your previous experience, expertise in tools, or your college information, Canva lets you put every important detail in your resume in the most vibrant and unique way possible, guaranteeing you a call back from the recruiters. And the best part? It’s absolutely free! 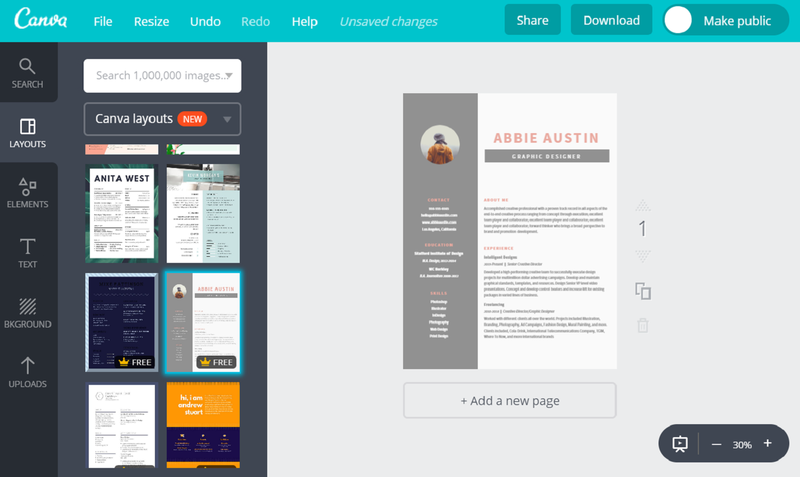 Create a new Canva account to get started with your resume design. When everyone else is sending boring resumes that all look the same, you need a distinguishing resume that sets you apart and creates a lasting impression on the recruiter – that’s exactly what Canva helps you to do. Our team of amazing professional designers have already created thousands of visual resume layouts that you can edit quickly. Change the background, add images, or change the text easily to customize your resume according to your skills and dream job. Already have a great resume design in your mind? Canva has the tools to give wings to your amazing ideas. Start with a blank layout and drag and drop visual elements over the resume design. Take advantage of our predesigned font combinations and typography to add your personal details. You can experiment and create your own font combinations too using our 130 fresh available fonts. Before you send out your resume to a company, it’s important to double check that every information you have added is absolutely correct. You could have made a few errors here and there and not noticed. The best way out would be to share your resume with your friends and family and ask them to check for any errors. They could also give you feedback on the resume design. To share any design on Canva, click on the share button and add the email address of the people you want to share the design with. Check the ‘can comment’ box if you just want them to share their feedback on the design. After designing, download your resume in PDF-Print format to get a printout of your resume that you can mail to recruiters or take with you to interviews. You get 300 DPI (Dots Per Inch) high-quality print every time so that your resume is never pixelated. Alternatively, you can also download the resume in PNG or JPG format to send it to recruiters. Clicking the ‘share’ button gives you the option to email your resume directly from Canva. How much does it cost to create a personalized resume on Canva? Creating a resume on Canva is absolutely free. You can create as many resumes as you want and edit them as many times as you prefer. You are only charged if you use a paid elements from Canva’s media library. Most of the elements are free, while only a few cost $1 for each one time use. Can I add logos of the past companies I have worked for in the resume? Yes, you can! You can add logos of the past companies you have worked with and also your own image on the resume. Click on the ‘Upload your own images’ button and select the images from your computer that you want to add to your resume. Drag and drop the images to your design and you are done! Why is there a watermark on my resume? How can I remove it?